Ordinary young Chinese may not have paid close attention to Xi Jinping's 3.5-hour speech this week, but they're happy to "applaud" the president in the newest viral phenomenon to sweep China's internet. Tencent, the Internet giant behind the WeChat messaging app, rolled out a game this week that lets users clap for Xi by pressing on their phone screen as many times as possible in 19 seconds. In just three days, the game has racked up 1.2 billion plays, as many shared their scores on social media and challenged friends. Xi kicked off the ruling Communist Party's 19th national congress this week and declared a "new era" of China's rise on the world stage. Delegates next week will grant him a second five-year term as party leader and select new members of the nearly 90-million-strong party's leading bodies. 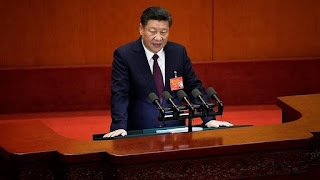 Xi has amassed more power than any Chinese leader in decades and frequently receives public displays of loyalty from party cadres, prompting warnings from his critics that China is sliding dangerously toward one-man rule. A populist leader who has spearheaded a sweeping anti-corruption campaign, Xi's face appears prominently on billboards and trinkets sold in tourist areas. Top officials frequently invoke his name and gush over his political thought in ways that have drawn comparisons to the Mao Zedong era. In the Tencent game, users are shown a brief snippet of Xi's speech on topics such as improving the lives of poor farmers or regulating the housing market to protect young homebuyers, and then encouraged to tap the screen to applaud. Some users reported high scores attained by tapping more than 80 times a second. The game is an example of how the party has leveraged the Internet and popular culture to spread its message, encourage patriotism and instill loyalty to the leadership, especially Xi. At the same time, Xi has called for tighter party control over Chinese industry, including the tech sector that has traditionally thrived with relatively little government interference. Several reports over the past year indicated that the government is considering buying stakes in tech giants, including Tencent. One of China's most powerful Internet companies, Tencent was fined by regulators in September for failing to regulate content being shared on WeChat, a ubiquitous app that is used for chats, payments and everyday shopping. The Shenzhen-based company did not immediately respond to a request for comment.